I flopped onto the bed when I got home. Tears streamed down my face, soaking my pillows. I'd just returned from seeing my classroom for the first time—and it didn't look good. "You'll be sharing a building with the custodial staff," the assistant principal said, as she unlocked my classroom. "But the open space shouldn't be a problem. Good luck!" The school had created a space just for me, and the 143 students that would wander through the door in the course of a day. But with desks stacked floor to ceiling, bare walls without so much as a white board, and the shirll, incessant grinding of metal on the other side of thin plywood walls, I felt like I was doomed to fail. For a while, I couldn't seem to see past myself. Although I wasn't a novice to the teaching profession, I was new to poverty. And all the training which I'd received in college (and from teaching the previous three years) hadn't prepared me to adequately deal with the problems my students brought into my classroom, through no fault of their own. 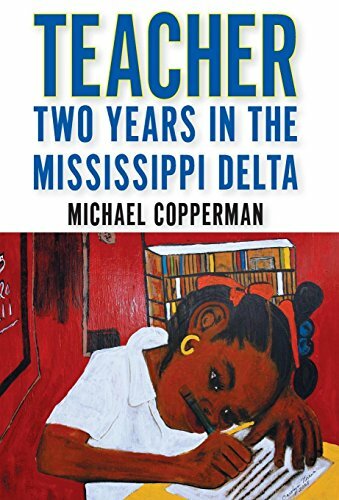 I suppose that's why Michael Copperman's memoir, Teacher: Two Years in the Mississippi Delta, struck me, both positively and negatively. My own experience in a low-income school mirrored the author's in more ways than one. But when the poor and marginalized remain the "other," and when the main character lives on as the hero of his own story, even the greatest of tales can leave a bitter taste in the reader's mouth. The premise of Teacher is catchy (you can almost imagine it as a pitch for a screenplay): What happens when a fresh-faced Asian American college graduate is assigned a rural teaching position in the poverty-stricken Mississippi Delta? Copperman recounts his experience in mostly chronological order: In 2002, he turned twenty-two on a Saturday and graduated from Stanford University the next day. Within hours of celebrating, he flew to Houston, Texas, to begin five weeks of training with Teach for America, a domestic version of the Peace Corps that places well-qualified college graduates in low-performing schools across the nation. As the reader might expect, Copperman is zealously passionate about his undergraduate experience. Of his experience on "the Farm," he writes, "I believed that everything I wanted to accomplish was not only possible but imminent, pending only my own realization of what exactly it was I aspired to do." Like many immature young adults entering the professional world for the first time, he believes the world is his oyster. He will institute change in one of the most discriminatory and disfunctional educational systems in the US. He will make a difference in the lives of elementary-aged children over a two-year period. He will instill confidence, character, and a desire to learn in the hearts and minds of his future students; after all, this was fundamental to his own upbringing, a gift he can bestow on future generations. At this point, 30 pages into the book, I wondered whether or not I'd come to see dynamic growth in his seemingly static character. I began to hope for a tragic downfall, if only to make him more accessible to me as a reader. For, lest one forget, his words are memoir—the type of writing driven by the internal conflict of the first-person narrator. And, if the main character remains so utterly impenetrable, how can a story be believable? Luckily, the story itself is captivating. Copperman arrives in Promise, Mississippi, to find his classroom in utter disarray—a problem a little bit of elbow grease and a trip to the local discount store quickly remedy. His intimate assessment of the black-white divide on the Mississippi Delta, evident even in the aisles of Walmart, is haunting: "The groups were always all white or all black and kept a steady distance, as if bound by invisible strings." Because he sees himself as the "other," as a "mixed-race Japanese-Hawaiian Russo-Polish Jew," he is particularly aware of the inequities, both blatant and subtle, that his African American students have to deal with. And his testimony as a first-year teacher is something all first-year teachers, no matter their training, experience, or credentials, can attest to as truth. Classroom management, Copperman realizes, is not for the faint of heart—especially if you find yourself in an unfamiliar culture, with an inadequate amount of training to boot. (Teach for America has been under heavy criticism about this.) What do you do when a student spits in your face, or when an entire classroom of ten-year-olds rallies against you? What do you do when you feel like your only option is to adhere to culturally accepted means of physical punishment? And what do you do when trying your hardest doesn't seem to change the social, academic, and emotional fabric of your students' lives?